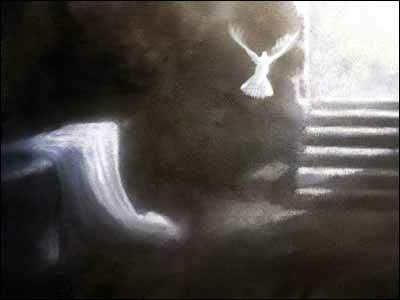 As I was praying for you and anticipating the wondrous joy that is ours because of the Resurrection of Jesus, I was reading the Gospel accounts thinking about the mixed emotions that filled the first witnesses who arrived at the tomb. Mark’s Gospel helps us to recount the emotional, intellectual and spiritual breadth and depth of this experience. This day that changed human history began not with celebration but with grief, tears and frustration. Those who join us for worship on Easter are just like these women, just like us, overwhelmed by grief, remembering loved ones who have died or are dying. Perhaps they are dealing with their own illness or broken relationships. Perhaps like these women, they will be fear-filled and insecure, in a world rocked by terrorists, extremists, tension, civil war, nuclear proliferation, and unstable leaders. Perhaps that sense of loss and despair is rooted in financial struggles, insufficient funds for retirement, trying to find a job or keep the current one. In the midst of grief, tears and frustration, people will join us searching for answers, hope and faith to keep them moving through overwhelming circumstances. I am convinced that what kept those women moving forward was more than a sense of duty, obligation, commitment, or righteousness. It was love for the one whose body they were to anoint. They trusted Jesus. They believed in Jesus. These were women of faith! Faith tells us that, despite the stones that seem immovable and despite mountains along the way that seem insurmountable, we need to keep going! Faith is not trusting in our own ability to move mountains. Faith is believing in a God who moves the immovable and overcomes the insurmountable. How much faith do you need? This was a question that even Jesus’ own disciples asked Him. Jesus responded by telling them all they needed was faith as big as a mustard seed. That was the faith that summoned those women to the tomb on that first Easter morning. It was faith sufficient to believe in His promises, to love Jesus in the midst of the worst of circumstances. This is the faith that kept the women walking toward the tomb. This is how Easter breaks into our lives, when all seems lost, when we least expect it. When they arrived at the tomb they saw the stone rolled away. What do we do with this experience, this message? I am convinced that we must read the Scripture not as though it is the historical record from the ancient past, but as though it is happening to us — our experience — now! You are the one on your way, you are the one taking those painful steps to the tomb. You are the one amazed by the stone that is rolled away, overwhelmed by the angel and his words. The Easter proclamation is God’s intervention in your life and our life together. This is intervention we desperately need as we struggle to survive in a world filled with fear and hopelessness, where people are confused and skeptic of all our human solutions that fail to overcome our largest problem, sin and its consequences. This intervention is vital as we have become addicted to our own solutions. When will we finally admit that governments cannot save us? That all the well-intended humanists striving to create a utopian society cannot save us? When will we learn that our wealth cannot save us, nor will our innovation, our science, our technology, nor all our combined knowledge? The message of Easter draws us into not just any miracle but the greatest miracle of all, Resurrection. Jesus, who died, is now alive! The entire mission, power and faith of the Body of Christ is focused on this one central miracle. Yet even in the church today there are those who minimize the critical nature of the Resurrection. On Easter, my pastor said that Jesus just fainted on the cross and that the disciples nursed Him back to health. What do you think? Beat your pastor with a lead-tipped whip 39 times; nail him to a cross; hang him in the sun for six hours; run a spear thru his side … put him in an airless tomb for 36 hours and see what happens. This humorous anecdote is an apt description of our human response to those things we don’t understand. Miracles give us a glimpse of a Biblical worldview — a Kingdom of God worldview that Jesus proclaimed. Miracles have no place in our secular worldview and our first reaction is to reject them or find some reasonable explanation. Some have tried to share with me their experiences that defy reason. They have difficulty finding words. Even some of the best communicators realize the limitation of word choices and communication skills. They simply declare, “This is beyond words!” Some experiences seem so out of the ordinary, so bizarre, that people fear recounting them because others will think they have lost their minds. I understand this not only from the reported experiences of others but also my own. Contemplating this reality will help us understand even more deeply the experience of these women, the first witnesses of the Resurrection. Perhaps God knows that, before we can glimpse the depth and vastness of His Kingdom, both our hearts and our minds have to be broken. With a broken heart and mind, we are forced to realize that we can’t save ourselves. There is only one source of salvation, only one power that can redeem and save us from our perilous situation. God calls us to a new understanding of love and a new worldview in the Cross and Resurrection of Jesus. Resurrection is what you get when you combine God’s power with God’s grace — love so powerful nothing can stop it, nothing in life and nothing in death. How much faith does it take for this Easter Gospel to transform our lives as it did these women, the first witnesses of the Resurrection? It takes just enough faith to take one step in the direction of Jesus and then another and another. It takes just enough faith to trust in the promise, to trust in His profound love for you in life and even in death. Every step in His direction will convince you that He is the Way, the Truth, and the Life. There is salvation in no one else. His love draws us in and His Holy Spirit empowers us even before we take that first step or the next one. In many ways, the Word of God is so believable because it is so painfully honest about the human experience and condition. If this was a story of human invention, the Gospel would not end this way. In spite of the angel’s proclamation and instruction, the women run in fear. In Verse 8, we read, “They said nothing to anyone for they were afraid.” The most powerful, defining story of their lives and human history and they said nothing to anyone! How can this be? When we consider our own culture in North America, our lack of going and telling is now showing. The number of those who proudly declare that they have no religious faith is expanding. Agnostics and atheists are organized as a political movement. Not only have mainline denominations been in a state of decline for the past two decades, but even Evangelicals are declining, and mega-churches are struggling. We so desperately want to fit in with our culture, fearing what others may think of us, we say nothing to anyone. We try to do good without telling. We try to love without sharing the love of Jesus. I contend that our conformity to culture makes it even more difficult for Christians in other parts of the world to continue to be bold in their witness. They have much to teach us as they risk imprisonment and even death for going and telling. Isn’t it interesting that churches in North American and Europe that have sold out to contemporary culture are dying? Their members are loyal to institutions and organizations, playing it safe, risking little or nothing. Yet, where churches have remained faithful in their proclamation of the Gospel of Jesus Christ, even in the midst of harsh persecution, their churches are growing. Those disciples of Jesus are risking everything, even giving their lives for the sake of the Gospel. We come this Easter to worship a living Lord Jesus who is still moving mountains, softening hardened hearts and igniting the spirits of His people to go and tell. He is just as personally present today as He was when He met those disciples on the first Easter morning. He is calling us to have faith in Him, to keep moving in His direction, nurtured by a community of faithful followers relying on the Holy Spirit, the truth and power of Word and Sacrament. They are only waiting for someone to let them know. Jesus is depending on us to get out the message of Easter. As I speak about discipleship I recount Dietrich Bonhoeffer’s contention that faith and obedience are inseparable. I have also learned that love and obedience are also inseparable. “And this is love: that we walk in obedience to His commands.” (2 John 1:6). The Easter Gospel does not end in silence. The additional verses had to be written to conclude Mark’s Gospel account. These women who loved Jesus were also obedient. They did go and tell the other disciples. They were the only ones who could share this experience with us. They may have been silent for a little while, but not long afterward they followed the angel’s instruction. They went and they told others, and so must we! No fear or threat is stronger than this Easter proclamation.